Remember the last time you couldn’t find anything to read? Yeah, didn’t think so. The internet puts more content at our fingertips than previous generations even had theoretical access to. The problem of having nothing to read has gone the way of the dodo. Now our problem is choosing what to read. The problem’s big enough to warrant a whole new category of software. Read-it-later tools ensure we never lose anything of interest and give us a place to read them. Instapaper, Flipboard, and Pocket all emerged in the last 5 years and have become mainstays for most design-minded professionals. But there’s a new kid on the block in this category. Only, she’s not so new. She’s been around since the beginning. 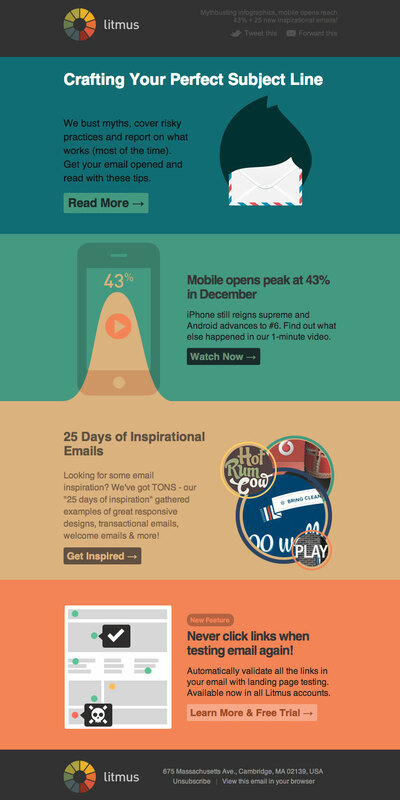 The hottest way of delivering news in 2014 was the trusty email newsletter. Many writers have started newsletters packed with tips, insights, and wisdom you won’t find anywhere else. And even larger publications make their content available via email. Once the tool everyone hoped to escape, the inbox has come into its own—again. The issue now? Too many newsletters! And we’re here to solve it. We gave you our list of top design podcasts a few weeks back. Since then, we’ve been sifting through a massive pile of emails, hunting for the best newsletters the web has to offer. Sidebar is probably my all-time favorite. It’s just 5 links, pointing you to 5 amazing things you definitely want to know about, every day. The website itself isn’t much to look at—nor is it particularly usable. But that’s not the point here. The point is one amazing email. If you haven’t already, sign up for Sidebar. Posthaste. Hey Designer is a lot like Sidebar—with a touch more restraint. Instead of daily emails, you get weekly missives every Sunday, so it’s great for lazy-day reading, or gearing up for work with some commute-time reading. It also has a more user-friendly site than Sidebar, with categories (channels), search, and a feed. If you know Smashing Magazine, you know what to expect here. 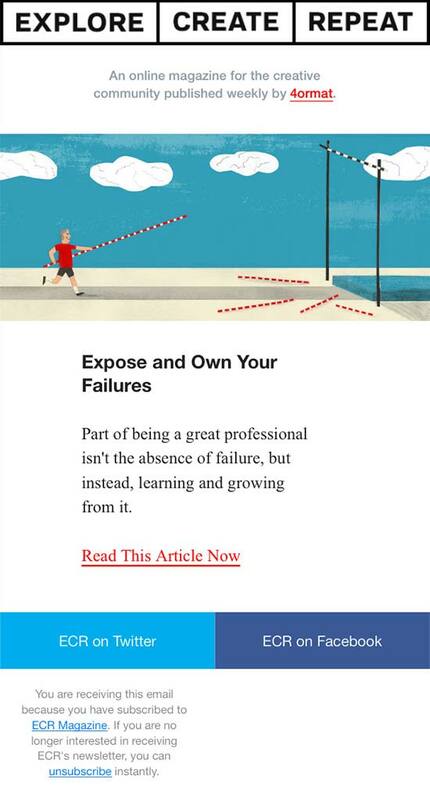 But unlike many a blog newsletter, Smashing focuses on curated links—not their own content. You’ll find Smashing’s own stuff toward the end, but this Newsletter is an act of generosity—a love letter to all the people who make the web such a powerful part of our lives. Top discussions from Designer News and Hacker News, just in your inbox. Need we say more? The Weekly Replay recruits the week’s top shots and sends ‘em on a fast break at your inbox. At least one’s sure to be a slam dunk. I need a time out from all these basketball metaphors. Shouldn’t come as any surprise that our pals over at Litmus put out one hell of an email. After all, email testing and tracking is what they do. Need convincing? Check out the amazing emails post they put together for us! Correspondence courses are a very old idea, but Hack Design updates the concept with an online learning center, lesson-based emails, and a handy list of great design tools. Many of the lessons will be old news for you savvy designers, but several take unique perspectives on familiar topics, such as “Typography in Product Design.” So it’s good for a refresh—and awesome for anybody whose design literacy could use a little, ahem, working on. I cannot extol this one enough. It doesn’t just tell you what to do to make your product/feature/marketing work, it tells you why it’ll work. Which reminds me of that old adage about teaching someone how to fish, rather than just giving one. This newsletter’s a wise old fisherman. Listen up. If staring at type is the kind of thing you do recreationally, this one’s for you. Especially if the web’s type renaissance constitutes one of your dreams come true. In a world awash with socialization—and calls to share stuff—read-it-later apps can often feel a little isolated. They turn a highly public, visible, and communal space into your own private library. I love that feeling, personally. But some want to get a little outside inspiration. Instapaper Weekly brings other readers’ obsessions into your inbox, and, naturally, into your Instapaper account. You aren’t getting this already? Really? Are you not on Medium? A lot of design blogs obsess over the directly relevant. They give you tips and tricks on using Photoshop, or list the year’s top fonts, or philosophize on responsive design. It’s a great model—but it can be really refreshing to dive into something a little broader. Like finding work-life balance. Or unplugging from Twitter. Of finding your voice. Topics like those are why I love 99U. To quote their subscription modal, “Every day we send an email with a handful of our top stories and videos and none of the clutter, noise, or cats that usually distract you.” Sounds nice, right? Quite possibly my favorite from the whole list. No, scratch that, it is my favorite. This is the news reader with the news you won’t get anywhere else. Engaging, beautifully written stories you won’t always expect to like. But you will. Perhaps most exciting for someone like me, the curator is not an algorithm, but a real live person, just sharing what he finds interesting. 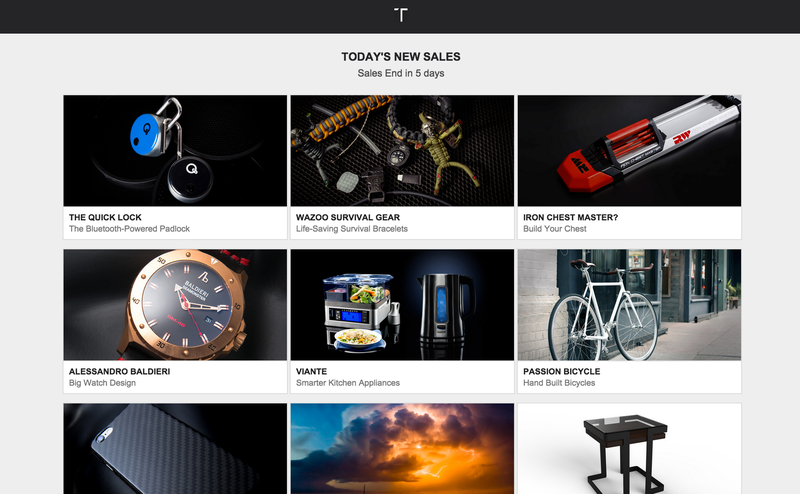 What do you get when you combine personalized news with Flipboard’s beautiful magazine-inspired interface? A really cool newsletter. Mashable’s newsletter provides a nicely personalized entry point to the sprawling news portal. The ability to choose between top stories, breaking news, and what’s going viral is nice. 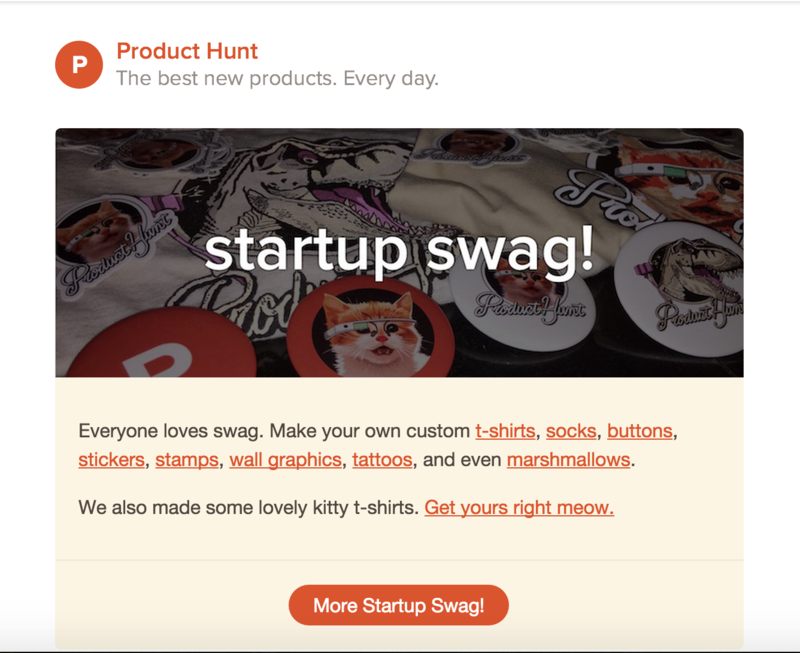 The easiest way to stay up to date on the latest and greatest products, Product Hunt’s newsletter lets you know what’s new, and resurrects older products for you with interestingly themed editions. I heart Vox’s concept of contextualizing top news stories, and their newsletter delivers. Literally. This twice-daily newsletter from our pals at LAUNCH Festival brings you the latest from Silicon Valley and the tech scene at large, keeping you abreast of those going IPO, who’s launched what new product, and who’s acquired who. It’s all in the name for this team. Beautifully designed, painstakingly crafted, money-isn’t-much-of-an-object stuff. For when you don’t just want a thing—say, an axe—you want the best of the thing. Why comb through Amazon reviews, or po-go stick around the web, in search of stuff you want, when you can have it suggested to you? Cotton Bureau’s like a hyper-focused Kickstarter, where the only things that get crowdfunding are T-shirts. Beautifully designed, often witty, and really comfortable tees. And if you’ve always wanted to make your name in T-shirt design, you can submit your own work. If you’re the type who doesn’t want to wear, use, or furnish your home with the same stuff everybody else does, you’ve been looking for Custom Made. Want to improve your work life? The Modern Desk promises to help you do that with a fine selection of apps and accessories handpicked for the modern professional. Oh, Ugmonk, you beautiful, wallet-sapping monster. Subscribe at your own peril, dear reader. The dollars will flow. Gorgeous photos of items you can actually own. What’s more, every handpicked collection boasts amazing small-batch or independently designed items, from mid-century to postmodern. The most beautiful (and often, useful) upcycled and handmade goods on the market. Look out, Etsy! Ciotti, a marketer and content strategist with our friends at HelpScout, says of his newsletter, “if you enjoy seeing well-established research applied to practical lessons on creative work and human behavior, you’re in the right place.” Sounds good, right? If you think there might be some value in regularly hearing from a designer who’s currently a VP at BuzzFeed, and has had stints at Etsy, Amazon, Formspring, and Zoosk, then you should sign up. We do. All too often, people approach creativity in a hazy, lazy, almost mystical way. Not so Shawn Blanc. He takes a clear-eyed, sober look at how our choices affect our creativity—and much more. He also happens to be a very inspiring example of someone who’s invested everything in his writing, and succeeded. This weekly magazine for the creative community gathers fine, mostly short opinion pieces, interviews, and advice on skill development and tools (usually of the inner, mental sort, rather than software). Quick, yet meaty reads. Gibbon’s quickly become a favorite learning and teaching tool of mine, as it lets you quickly and easily curate “playlists” of articles on focused topics—plus read others’ “playlists.” The newsletter quite naturally hits you with suggested playlists based on your interests and learning history. Looking to perfect your morning ritual? You’ll find a treasure trove of ideas and inspirations in My Morning Routine, which delivers a brand-new morning routine every Wednesday. The web’s a wide, wonderful place, so we’re sure we’ve missed some stuff. If we left out an email you love, hit is up on Twitter @InVisionApp. And while we wouldn’t dare add it to the list, may we humbly suggest our very own InVision Weekly Digest? I'm the Director of Content Strategy here at Webflow. Nice to meet you.